There are some home DIY projects I’ve been wanting to tackle. I get nervous about trying something new especially if there is no going back once the project is finished. When you don’t like something and it’s permanent……….well, you just have to live with it. I googled tutorials for the projects I want to do and I think between me and the JTS we can handle them. Now to find the right time. 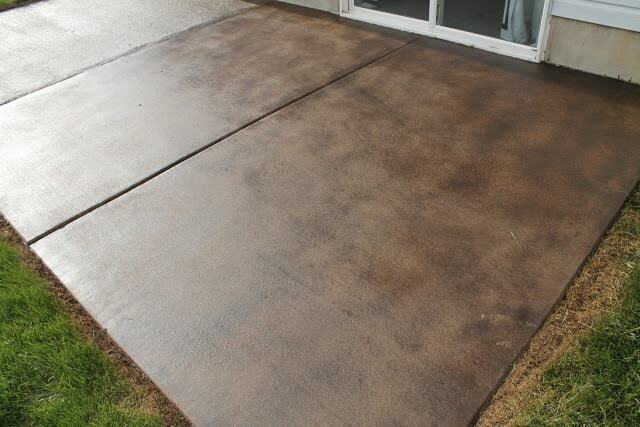 Some of the projects are outdoor projects like staining the concrete on our porch. So the time of year will have a lot to do with project timeline. Do you have any concrete around your house……..sidewalks, porch, patio? Our sidewalk is as old as the house I guess,which means it is over 50 years old. It’s kind of a mess and I don’t think we want to stain it. Staining our front concrete porch might be a project I want to try. The porch isn’t very big and it doesn’t work too well as a porch for sitting and visiting. No one uses our front door either. We’re back door people. I want to try painting an indoor/outdoor rug with a paint sprayer? Megan did and the rug looks great. I have several of those bamboo type rugs I would like to paint. I absolutely love the idea of painting old bi-fold closet doors and re-purposing them into weathered shutters for use indoors on either side of French Doors. Nancy used a two part paint process to get the weathered look. I’ve created this look before and even though it sounds difficult…it’s not! We have French doors in our dining room and I think the shutters would look good. I would paint my shutters a different color. 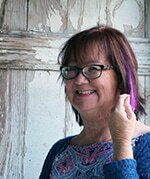 Nancy’s are weathered blue because she is the Queen of Coastal Decor! This next home improvement project is one I’ve tackled, more than once. Painting our front door and metal framed storm door. I’m adding it here because I’m ready for a color change. Just not sure what color I want to paint the door. I love that I painted the metal around our glass storm door to match the front door color. I wasn’t sure how it would turn out but that paint really stuck to the metal. Still looks as good as the day I painted it over 6 years ago. 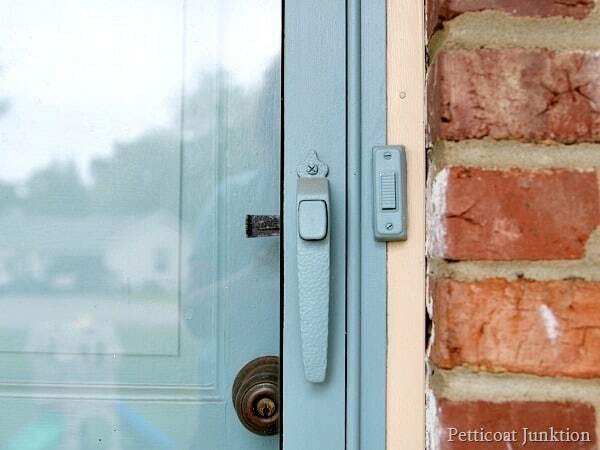 (maybe a little dusty) See how I did it here…Paint A Metal Storm Door. I also painted our back door and aluminum storm door 3 years ago. The aluminum storm door has a dent in it and the paint helps camouflage the dent. 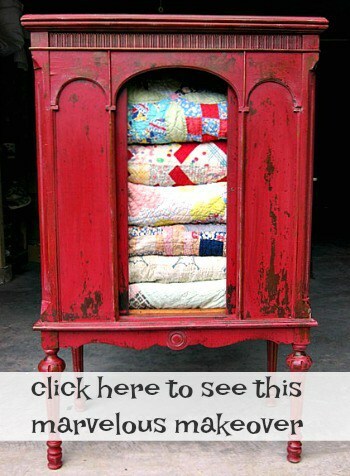 Beth tells me all the time how easy it is to paint fabric using Annie Sloan Chalk Paint…so this is on my to-try list. I run across upholstered furniture at the thrift stores all the time. A lot of times the furniture frame and springs are in good shape but the fabric is outdated. Maybe painting the fabric is the answer. Another project the JTS and I tackled 6 years ago was painting our shutters. We used a paint sprayer and the job was really easy. The most time intensive part was washing the shutters and taking them down to paint. See the project here….. Paint Shutters With A Paint Sprayer. 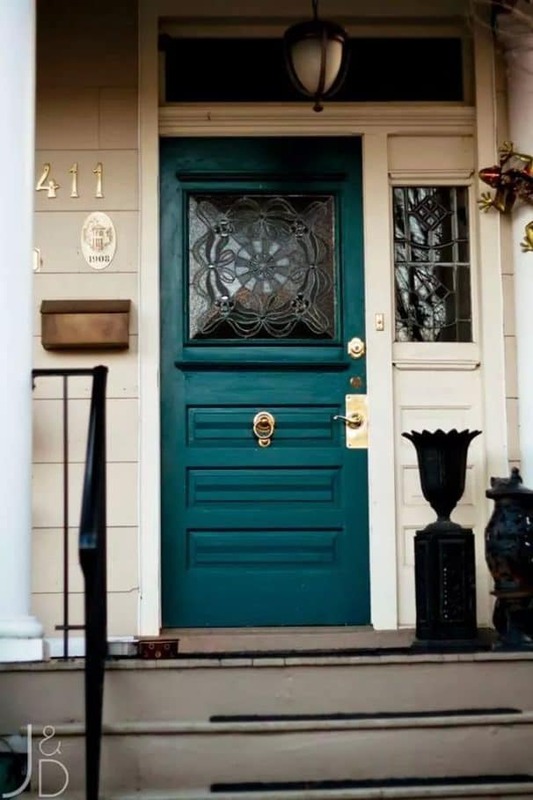 Okay, so I’m deviating a bit from the post theme….I need help with paint colors for our front door and shutters. This is what I’m thinking…. A deep rich teal color or maybe this Blue Peacock from Sherwin Williams. This is the color of the front door now and you can see the color of the bricks. What do you think about teal for the new color? I may paint our bathroom vanity. Not sure about that. There is a good tutorial here… paint and glaze cabinets from At Home With The Barkers. Sonya’s cabinets are truly a work of art. I love white cabinets with brown glaze in the little crevices and details. Our vanity is white but it’s that foil cover stuff, not real wood. The next project is a home decor diy. I’m not good at drawing or doing fancy writing and I’ve always wanted to try a transfer technique using a fancy font. I might give it a try…..Easy font transfer tutorial and painted tool box. The next DIY project is one I really need to learn. A tutorial on how to re-wire a lamp from Dwelling the Heart of the Home . I love vintage glass lamps and I have a ton of them waiting to be re-wired. Maybe not a ton, but a bunch. I’m scared to use the lamps with the old wiring. I know some of you have mentioned before that you can do this! I’m ready to give it a go. If you’ve always wanted to know how to paint problem furniture here’s a video I made that shows a secret technique! I like the teal color for the door. 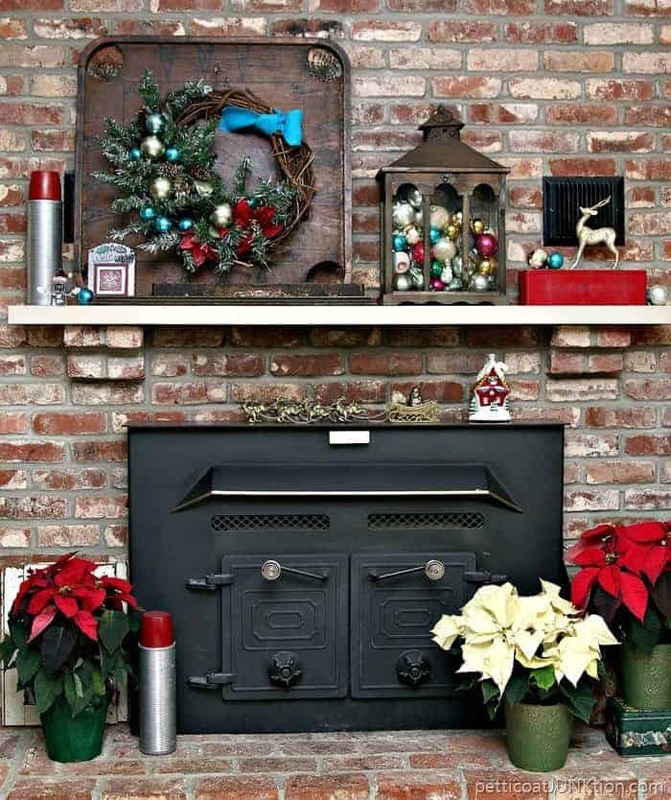 I have a fake brick wall behind my wood stove heater-it is nonremovable and I got so tired of the red & white wall. So now it is light green and the bricks are smoother than real ones but the grout stuff is rougher and harder to paint & dust. It wasn’t hard to paint, but I am sure real bricks are tougher to cover. I thin if you decide what to do color wise you will be happy to be rid of the red & white wall. Also I keep thinking of painting my front door barn red, which I will never do because it is a custom door but I still dream. Not sure my comment will still be relevant. I’ve been contemplating your door for a few days and here’s what I come up with: you could pick a color out of your bricks and paint your door that color. That way the front of your house would flow into a more consistent background. 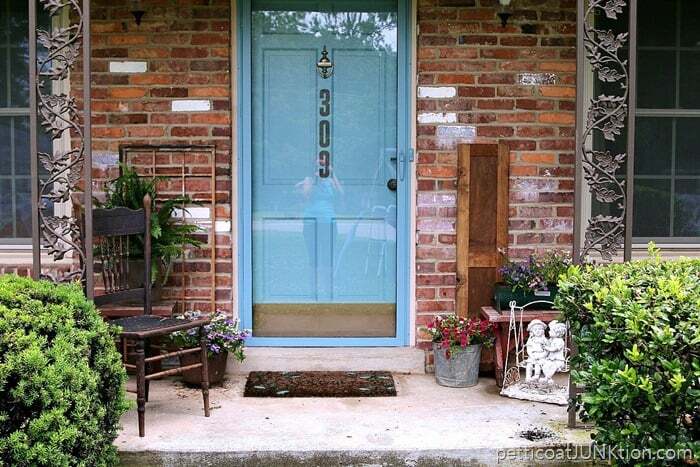 Then you could paint your porch accessories the brighter teal for accents. And this way you could easily change out your colors for the seasons, holidays, or current whims!! In the spring you could add pots of bright flowers, etc. I think adding some plants, real or fake, boughs or a wreath in winter would be a nice touch. Also, that brass plate at the bottom of the door would not stand out so much either. Well, I said I thought about this a long time! Thanks for the suggestions. I actually thought about going with the brownish gray in the bricks. Also, I’m going to remove that kick plate on the door. I originally put it on when I painted the door red years ago. I’m tired of it now. Thanks for your feedback. It’s much appreciated! Thanks for sharing…Pinned many of your suggestions/links. As usual you have given more to think about. I have a brick house and that looks so much like the color I bought for my doors, Valspar’s Gypsy Teal, I picked up that one and a burgundy, totally going with the teal. I’m switching out from white, my shutters and trim are white and the roof is black but I think it will give me the pop of color I’ve been looking for. Thanks for these … always feel more confident when it’s a project you have done! You inspire and you explain .. love it! As for the door, I LOVE the teal door. Makes a great statement! Love,love,love that deep teal color. I wanted to paint our front door that shade, but couldn’t find it. And went with a different shade of blue. Actually, haven’t done it yet. Let me know what color that is! I also have many projects around the house that need done. Good luck with that! That teal is amazing! Definitely paint your front door that shade. Some really great ideas….thanks for sharing. I think it is really nice that you have links to other sites. I have several lamps that need rewiring. Doesn’t seem so scarry now! Thank you! Great…Thanks so much for sharing! I need to check out many of these. Thanks for the great links! I saved quite a few of them!